What a sweetie pie Leland is! 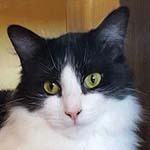 He is an easygoing gentle guy that gets along well with cats of different ages (including playing with kittens) and has a lot of love to share with his foster mom as well. He may be initially shy in a new home but once he is comfortable, he will come looking for attention and greet you with soft meows and purrs. This handsome cat has a coat like silk and very much enjoys being pet and groomed….nuzzling your hand in the process! Leland gets along well with the cat-friendly dog in his foster home as well. This darling boy is sure to charm you! Are you or someone you know his forever person for his forever home? 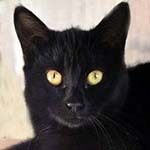 He has been neutered, is current on vaccinations and you can see Leland at Petco, Montecito Center, Saturdays 11 am to 4 pm.